A claim that female shop workers should get the same wage as male warehouse staff could cost the UK grocer up to 4 billion pounds. It’s a lesser-known twist on equal pay. While retailers Asda and Sainsbury’s face similar legal challenges, all sectors may be exposed. 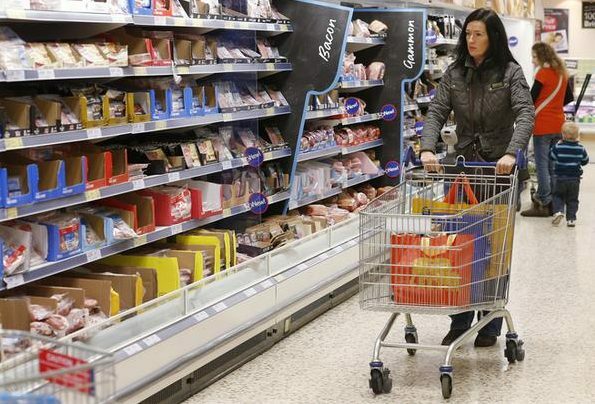 Customers shop at a Tesco store in Bishop's Stortford, southern England. Tesco faces a potential bill of up to 4 billion pounds in an equal pay claim, according to Leigh Day Solicitors, the law firm pursuing legal action against the supermarket. The case will argue that employees working in the male-dominated distribution centres are paid considerably more than the largely female-staffed Tesco stores for doing work of equal value. The alleged underpayment of workers could apply to more than 200,000 Tesco employees. Based on pay shortfalls of up to 20,000 pounds per worker, the final bill for Tesco could be as high as 4 billion pounds according to Leigh Day.